Near the end of the month I overhauled site CSS and re-added the comment templates, as detailed in the changelog. Leaving comments open on every page and post gave me nightmares, so a few hours after the comment code went live it was appended back to the old fortnightly shutoff, making this the first comment enabled update in quite some time. The overhaul of the site look and feel is a lot more visible – and important – than the comment bits, and after a few additional tweaks I think I’m fine with it. I liked the initial v13 layout but the color scheme bugged the heck out of me for awhile. Conforming the site palette back to what’s become the ATC Standard has put that little demon to rest; the site looks better than it ever has and will hopefully stay this way for awhile. Those bits will be copied into a full set of corridors and compartments at some point later this month. Then shaders will be tweaked, minimal texturing will be applied, and the environment will be lit. Before that can happen I need to finish modeling props – fortunately with the corridor pieces and compartment done I’m down to the hard stuff. The sickbay is now where the Daedalus compartments were when I started work on them in late January: a set of walls and a door and a couple of reference dummies. It’s time for some custom built furniture and a hospital bed; probably on the Star Trek side of the detail curve. While I haven’t worked on the script much in the past few weeks the page allocation for the scene that features the sickbay hasn’t changed – it won’t be on screen long, but it still needs to look reasonably detailed. 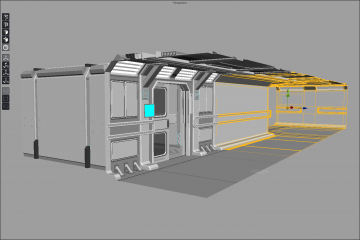 While the amount of work going into it feels a bit excessive it’s not quite as bad as the Banshee launch tube – while I happened onto an additional use for that it was planned as a one-off; sickbay debuts here and is planned to appear again later. As such it’s an intermediate environment – it needs to live up to the mind-altering environmental overkill of Transitional Voices production values but also needs to take it down a notch, heading in a more sustainable direction. I haven’t drawn a page of ATC since September; I’d like the between-chapters downtime of the next installment to be on the scale of a vacation as opposed to a friggin’ sabbatical. To that end: the ad copy, milestones and pledge tiers of an ATC patreon campaign are in the early-to-middle planning stages. I haven’t committed to developing the ideas into a thing yet – I’m still thinking on it, though that thinking is at the point where I could probably lay down a pretty clear outline of what it’ll look like at this point. I’ve had some serious issues with people telling me to “be reasonable” about my goals, and would probably still be stewing about that if ATC wasn’t moving soon. More details on that later. The relevant point is this – I’ve never had to pay for ATC’s hosting with money, so covering that new expense seems like a pretty reasonable first-rung milestone when it comes to seeking patronage for the project. I’ve talked about the impending move on IRC; I’ll recap the results of those discussions here. My “day job” involves developing websites, so I need to be able to eat my own dog food. I have always developed the ATC website and intend to keep things that way – for as long as developing websites is my primary source of income, anyway. New hosting will cost money (boo!) but will give me more control and I won’t have to bug anyone about things like subdomains and databases (yay!). I’m happy with ATC as a WordPress site and the only learning curve I intend to subject myself to in the process of migration is setting up the hosting account. I’ve had a great run with the guys that have hosted my work over the years and doing that end of it myself is a natural next step. Script: Still in development; asset development is presently a higher priority. TV.4 CG Assets: Largely complete and on the home stretch. Patreon: In the planning stages, which is a step up from the “conceptual” stage. Production Resumes: After the site relocates. “Sometime in April” is the current best-case projection, though May hasn’t been ruled out yet. Further bulletins as events warrant – hopefully before the end of the month, or around this time in April. Thanks to ejp for the post title. 86 queries in 0.825 seconds.